Photo courtesy of New Era. The tombstone of Johann Heidmann, a missionary and spiritual father to the first 90 Basters who crossed into Namibia in 1868, was returned to Rehoboth. It is significant that this has occurred around the time of the centennial of the Sam Khubis massacre. The centennial commemoration of the battle of Sam !Khubis saw the repatriation from Cape Town of the tombstone of the late Johann Christian Friedrich Heidmann, who was a spiritual father to the first 90 Basters who crossed the Orange River from South Africa into Namibia in 1868. Heidmann was a reverend at Rehoboth from 1868 until his retirement in 1906. 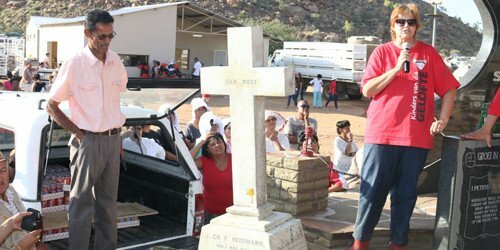 “This is the tombstone of our spiritual father,” said chairman of the Sam !Khubis Organising Committee, Jacky Britz, to the thousands of descendants of the Rehoboth Baster who gathered at the Sam !Khubis Heritage Site on Friday to commemorate the battle of Sam !Khubis, which took place 100 years ago. The missionary Heidmann’s tombstone was recovered from a cemetery in Ottery in Cape Town where it had to make way for the development of a business complex during the course of last year. Heidmann was born on November 1 1834 at Moringen near Lübeck in Germany. He was a trained glazier and joined the Rheinische Missionsgesellschaft in 1861. He was sent to South Africa in 1865 and became the Rhenish missionary to the Basters at De Tuin, where he took over from Sterrenberg in 1866, and Schietfontein in the north-western Cape Colony. He crossed into Namibia with 90 Basters in 1868 and served as a missionary until his retirement in 1906. He moved back to Steinthal near Tulbagh in South Africa after retirement, and in the end suffered from dementia and died on June 30 1913 in Valkenburg mental hospital in Cape Town. No political statements were made as the day was solely devoted to thank God for saving the lives of their forefathers and the near extermination of the ‘Volk’, when the German colonial army attacked the Baster people who had fled to their last stronghold at Sam !Khubis. President Hage Geingob conveyed his support to the Rehoboth community during the commemoration of the event in the spirit of ‘One Namibia, One Nation’. “The President would have loved to be in attendance at the event, but due to hostile tones expressed by some family members prior to the celebration, the Office of the President proceeded with other plans which means he is unable to attend,” said the statement from the Office of the President. The President also thanked Britz, the chairman of the Sam Khubis Organising Committee “for his statement rejecting the utterances issued by some members of the Workers Revolutionary Party and looks forward to meeting with members of the Rehoboth community in order to engage in mature and progressive discussions”. Under the theme ‘Children of the Covenant’, Dominee Heinz Olivier of the Rhenish Mother Congregation Rehoboth called for greater unity and forgiveness. “We have to forgive one another. If we don’t forgive one another then we will not experience peace,” said Olivier referring to the life and rule of the biblical Joseph in Egypt. “I think our people here in Rehoboth need real leaders not only political leaders but spiritual leaders who maintain an upright relationship with their Creator. Our Covenant over the years have become like a dry pit. We are all children of the Covenant. The pit of Rehoboth is dry because there is no one that can be seen as a leader,” he said. In the same breath he called on high office-bearers not to be selfish in creating wealth for themselves but to look and reach out to their fellow brothers and sisters. “Young people today do not want to struggle but want everything to fall in their laps easily. They want everything. The first thing they want as soon as they start a career is to buy a car, with new rims, fitted with ear-deafening sound systems. We must educate our children about the real value of money,” he said. The Sam !Khubis massacre is commemorated on May 8 every year since 1977 on the farm !Khubis, about 80km southwest of Rehoboth. The historical battle took place on May 8 1915.